Maine Gov. John E. Baldacci drove from state budget battles that continued into the early morning Friday to a breakfast presentation at the Edmund S. Muskie Archives on The Creative Economy and Maine’s Future. Baldacci was introduced at the breakfast seminar by Bates President Elaine Tuttle Hansen to about 130 guests from the Lewiston-Auburn community. Baldacci reminded the group that he will be returning next month for a two-day conference on the same topic at the nearby Bates Mill Complex. He said that the state’s role in the creative economy is removing impediments to growth, investing in communities, investing in laptops and education and training for youth and workers. Baldacci noted that one of the panels in the May conference on the creative economy will be on cultural tourism. He said people are drawn to Maine by its many craftsmen and for visits to Maine’s historic sites, villages and museums, such as Lewiston’s Franco-American Heritage Center and the majestic architecture of its Saints Peter and Paul Church. Baldacci said that the rejuvenation of the Lewiston-Auburn community “is showing the way, frankly, to the entire Maine economy.” He said that when a community develops the arts, it creates a synergy that builds on itself. “Architects are attracted to communities that have a creative base. They help renovate downtown buildings, they help fill up downtown restaurants, the multiplier effect creates even more jobs. And entrepreneurs are attracted to that vibrancy – bringing jobs in software and small businesses and more. 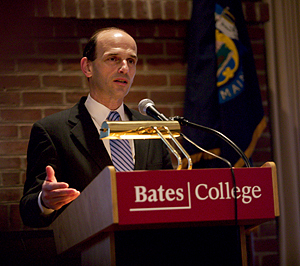 For more than 17 years, the president of Bates has sponsored a Breakfast Seminar that has brought leaders of Lewiston and Auburn together for presentations and discussion of local, national and global issues. As a theme for this academic year’s seminars, Hansen selected “Paths to Economic Growth and Opportunity in Maine.” Baldacci was the capstone speaker in this year’s series.